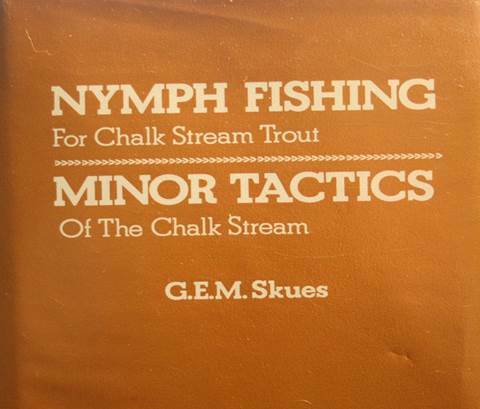 First published in 1939, Reprinted in 1960, the combined Volume of Nymph Fishing for Chalk Stream Trout & Minor Tactics of the Chalk Stream, First published in 1974 and reprinted in 1979. A. and C. Black Publishers Limited. ISBN 0-7136-1447-1. Some reviewers have not been kind in the past to this volume, claiming it was written by man who had become too full of himself or that his attacks on the Halford School of the Upstream Dry Fly was uncalled for; but I think that those reviews were written by either uninformed reviewers or ones who had some sort of agenda to follow. As for me I felt that this book offers a rare insight into the growth of the art of nymphing. If you follow the works of Skues it soon becomes obvious that he had a great deal of respect for the work of Frederic M. Halford and in fact in all of his books he had high praise for Mr. Halford. Some think that Skues only fished wet flies and nymphs but in fact he developed these methods to supplement the dry flies. In fact Skues fished dry flies throughout his life when they were called for. Skues and Halford had some areas of agreement and that both believed that their imitations should be delivered to trout that were visibly feeding and that covering the water was just something that was not done by ethical sporting anglers. In this volume Skues goes through all of his nymphing methods and clearly states the effects of nymphing and when they methods should be used. In 1938 the great debate occurred where the followers of the Halford School of Upstream Dry Fly Fishing, in fact wanted nymphs and wet flies banned from certain sections of the chalk stream. Therefore in this volume he covered the differenced and explains in a logical manner the reasons to use nymphs and wet flies and in my opinion Skues was struggling to understand why nymphs and wet flies were suddenly held in such distain. The nymphing notes and the tying notes are excellent and then the disagreements between the two schools of fishing are very educational. For me, I thoroughly enjoyed this book and found it very informative and interesting and would therefore rate it very highly. We often think of G.E.M. Skues as a fly fishing icon whose pronouncements were automatically accepted and adopted throughout the fly fishing world. When the truth was that the acceptance of nymphing methods would take a few decades to be fully accepted throughout the world of fly fishing. This book gives us a rare insight into the times and places which shaped the world of fly fishing. My copy is filled with underlined passages and many pages have notes in the margins.